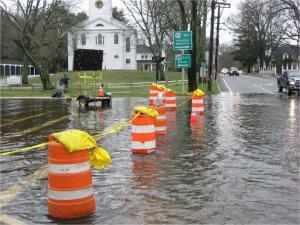 Massachusetts’ Climate Change Adaptation Report was issued in Sept. 2011. This important report brings home the expected impacts of climate disruption and describes actions our communities need to take to protect all sectors of our economy, including water resources. While we are now more aware of the danger of extreme events, like hurricanes, the more subtle impacts of climate disruption are less visible and easily ignored. Increasingly intense rainfall brings more pollution into our streams, ponds and rivers, eroding soil, carrying pollutants, and overwhelming sewage treatment facilities. But ironically more intense rainfall also makes droughts worse. Heavy rainfall doesn’t soak into the ground, and so the rain that falls is quickly swept out to sea, flooding our communities on its way. Then the water is gone. This is a clear and present threat to our drinking water supplies and wildlife. Increasing temperatures further stress aquatic life—particularly fish—and water quality for boating and swimming. This degrades the recreational use of our rivers. • adopt floodplain no-build zones that reflect the expected 100-year floods rather than outdated flood levels.